Love wine? Love online shopping? 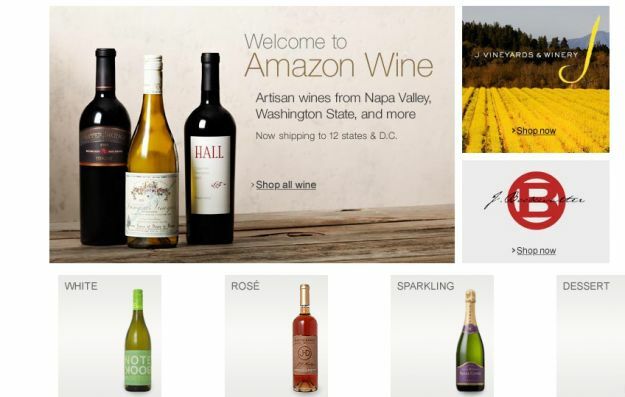 If so, you might be interested to learn that Amazon has just launched a new online wine shop. Amazon is hoping lovers of fine wine will come flocking to its latest specialist store, Amazon Wine, which launched on Thursday. Customers can choose from more than a thousand US wines, though due to the regulations of some states regarding the selling of alcohol across borders, the new new service is only available to those living in 12 states (California, Connecticut, Florida, Idaho, Illinois, Iowa, Nebraska, Nevada, North Carolina, Oregon, Washington and Wyoming) plus Washington DC, though Amazon says it plans to expand its service to more states in the near future. Bottles selling on the new online store cost from $10 up with delivery of up to six bottles priced at $9.99. In the hope of attracting buyers, Amazon is working with the wineries to produce an information-rich online store, offering a bundle of information with each wine including tasting notes, recommended food pairings and details of total case production. A wide range of wineries are covered by the store, from the relatively small family-owned and run Roadhouse Winery in Sonoma County just north of San Francisco, which produces just 3,000 cases a year of its hand-crafted Pinot Noir, to the enormous 650-acre Flora Springs Winery located in the Napa Valley. Amazon’s previous attempts at cracking the online wine market ended in failure when the companies it partnered with went bust. It’ll be hoping for better results this time around as it seeks to take on the likes of established online wine traders such as wine.com. Mitt Romney's Got "Binders Full of Women"!? Next: Taylor Swift to Perform in Times Square on New Year’s Eve! Missing Pet Tortoise Found After 30-Years Locked in Store Room! 38th CIGNA Falmouth Road Race 2010 Start on Sunday 10 a.m.